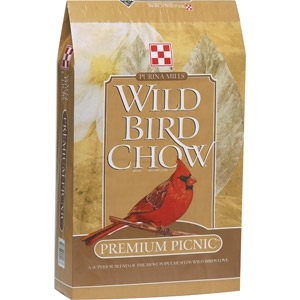 Birds will love the premium blend of Purina Mills® Wild Bird Chow Premium Picnic™. Perfect for Blue Jays, Cardinals, Chickadees, Evening Grosbeaks, Juncos, Nuthatches, Pine Siskins, Sparrows, Towhees and Tufted Titmice. It replaces other Purina® products: Premium Blend, Winter and Summer Blend. Available in 5lb, 20lb and 40lb bags. Ingredients: Black Oil Sunflower, White Millet, Safflower, Sunflower Kernel/Chips, Peanut Pieces, Raisins, Cherries.